I just now remembered to share this story with you guys. So I decided to get some popcorn at the store today, I felt hungry for popcorn. Not thinking whatsoever, I thought it was a good idea to get the unpopped kind that you stick in a microwave, to pop. That wouldn't have been a problem, if I didn't have an unweaned cockatiel that cries when he hears the microwave, regardless if he's actually hungry or not. So the story starts a little while after dinner (we eat dinner fairly early, so it was still before their bedtime), when I got some veggies from the leftover salad for Alex and Lucy. I put them both on the table with the veggies, and got the brilliant idea of making some popcorn, and eat at the table with them. I thought that they might be busy eating their own food to try and steal mine. But of course that wasn't the case. Alex stayed quiet until after the microwave went off, and I opened the door to get the bag of popcorn out. When I got to the table, he knew right away that whatever I had was food that came from the microwave. So naturally, he thinks that the food is his, since I use it to heat up his food. I sit down with the bowl, and put the bag with the remaining popcorn next to me. They're both curious about what I have, so I thought that they might leave me alone if I gave them their own piece. So I get two pieces from my bowl that had the least amount of butter on it. But obviously, that's not as fun as stealing it from me. They take a few bites out of the pieces, and then come over to my bowl to try and get a piece of their own. When Alex aimed towards the bowl, Lucy would aim towards the empty bag, and vice versa. At some point, they did return to the pieces I put on the table for them. Lucy ate half of her piece and fed the other half to the dog, and Alex ate all of his while making lots and lots of crumbs. Then they went back to trying to steal from me. What got me was that while I would shoo one of them off, the other would take the opportunity to try to be sneaky and get a piece themselves. There were a few times where they almost succeeded, too. You know, when I initially introduced Lucy and Alex to each other, I thought they would be busy driving each other crazy, and would leave me alone. It was like that for a little while, with Lucy trying to steal food directly from Alex's mouth, and Alex trying to play with Lucy's tail feathers, but now they're constantly working together to drive me insane. Alex seems to like being the distraction, while Lucy tries to go through with whatever they're trying to accomplish. Alex will try to climb onto me while Lucy tries to chew on my laptop. Alex will walk on my iPad while Lucy tries to chew on the buttons on the side. Sometimes, I wonder if it's intentional. While I'm feeding Alex, Lucy will try to find something to chew on, while on the counter (specifically something she's not supposed to chew on). I can't leave her in the cage while I feed Alex, or else she'll start screaming, and when both tiels are screaming, Dudley starts screaming. Then the noise becomes unbearable. So I guess it's official that Lucy and Alex are partners in crime. I was a little concerned on how they might get along, considering how different the two of them are raised. Lucy was co-raised which involved her bird parents feeding her, so she's aware of her bird-ish identity, while Alex is strictly handfed, and probably convinced that he's a tiny human. They seem to do fine though at least, and even while they're making me tear my hair out (figuratively), they're getting along, so that's good. 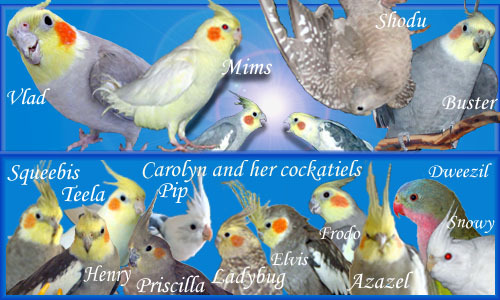 Cockatiels CRAVE popcorn. Somehow they seem to instinctively know that it's yummy. A good way to make popcorn for birds is to take a few kernels of plain popcorn, stick it in a paper bag or other suitable container, and pop it in the microwave - it's free of oil, salt, butter and whatever else they put in those microwave popcorn bags for humans. Lucy and Alex are both still young so it would be surprising if they didn't get along. Things are more likely to go wrong when you have an older bird who's well established and bring in a new one. Having Lucy around will probably help Alex keep his bird-ish identity too, since he has a (somewhat) older bird to follow and emulate. And if he's actually a boy, there'll be a female close by to respond to him when his hormones start speaking. I suspect that a lot of Vlad's failure to figure out mating is that he didn't have hens around at a critical age. That is true. Lucy has started acting a little bit like a big sister to Alex. Only problem with that is that she tends to be a bad influence. While checking out a newly-built outlet mall, I saw this "Amish Country Popcorn" (I kid you not, that was the name of the brand) at a kitchen utensil shop. It was basically popcorn without anything on it. Even the bag was made of some kind of organic degradable cloth. I think it would require an actual popcorn cooker, rather than a microwave. 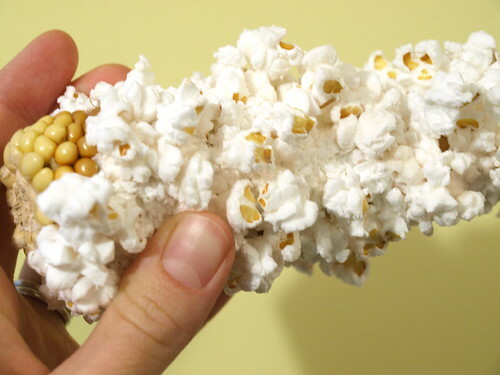 I'm sure there are places where you can buy the unpopped corn straight from the cob. I've seen videos of people putting a whole cob in the microwave, and having it come out like this. Now how about that as a treat for an entire flock? 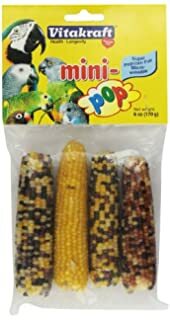 You can buy mini corn cobs to make popcorn for birds. 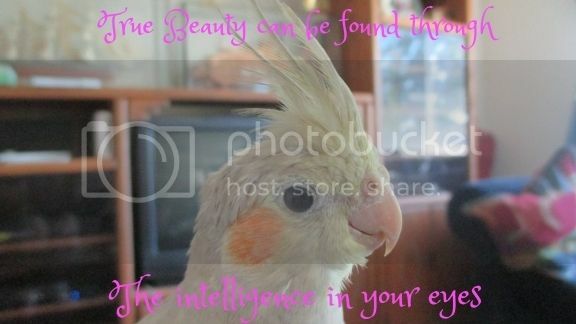 They're expensive though, and it's cheaper to buy a bag of popcorn at the grocery store and pop a few for the birds. Tj pops his own popcorn in a popper. So we can make it anyway we want 4 zorro we use coconut oil. 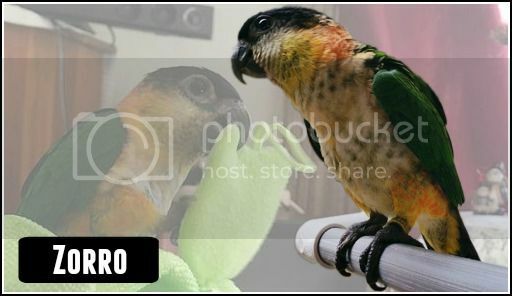 N one time zorro dive bombed tjs bowl from his gym. Full body belly floo. Contrary to current internet rumor, there's nothing magical about coconut oil lol. Most pet birds will be better off without added oils in the diet unless it's an oil that's high in Omega 3 fats. The original seed/nut that the oil came from has a lot more nutrients in it than the oil itself does, and it's got a less concentrated dose of the oil in it too. Feeding a little coconut meat would be better than using coconut oil IMO, but there are other seeds/nuts that are more nutritious than coconut. Are you implying it's not true? Please inform me. Next I looked at a site making “superfood” claims to see what they said: http://authoritynutrition.com/top-10-ev ... conut-oil/ My experience is that superfood claims generally turn out to be grossly exaggerated if you look at them closely. It seems to me that the saturated fat and cholesterol claims are the most important, so that’s mainly what I looked at. This site says the saturated fat in coconut oil is good because it contains lauric acid. There have been actual scientific studies showing that lauric acid helps raise HDL, the “good” cholesterol. But HDL is a more complex subject than we tend to think, and more isn’t always better. There are several subtypes of HDL and not all of them are good. Lauric acid raises LDL, the “bad” cholesterol too, but it raises the HDL more. It’s not clear which subtype(s) of HDL it raises and whether they are good, bad or indifferent; and there haven’t been any studies on whether there’s a net health benefit or detriment from raising your overall cholesterol in this disproportionate manner. 2. It’s fascinating that their health examples consisted of a couple of tiny Polynesian tribes that eat a lot of whole coconut, and not the large populations in southeast Asia that use coconut oil as their basic cooking oil as well as eating coconut in a lot of other forms. For example Malaysia, south India, Thailand, and the Philippines, places that are not particularly noted for their good health and longevity. Genetics have a strong influence on your health and longevity, and it seems likely that the tiny Polynesian tribes have some good genes going for them. So does my family, and we routinely produce centenarians in spite of our fondness for cooking with bacon grease. 3. These were very short term studies, and the abstracts don’t say that either coconut oil or lauric acid was involved. So it looks like the website might be assuming that coconut oil will have the same effect. All the studies compared medium chain triglycerides versus long chain triglycerides, not the effect of adding MCT to the status quo. The long term effects are unknown. 4. Stuff that kills bad microbes tends to be indiscriminate about what it’s killing, and may take out some good stuff too. 5. Ketone bodies are something that the body produces and uses when there’s not enough glucose to meet the body’s needs. Glucose is the standard energy source and running out of it is called “glucose starvation”. It can cause cell death and is not considered to be healthy. Coconut oil contains compounds that CAN be turned into ketone bodies but it doesn’t necessarily mean that they WILL. Dealing with short term studies again, and the abstracts don’t say that either coconut oil or lauric acid was studied. 6. Ketosis is generally considered to be a bad thing. There may be very specific circumstances where it is beneficial. 7. Talked about the complexities of HDL already. 8. Don’t know about this stuff, except that coconut oil has long been used as a hair oil in southeast Asia. They were laying it on thick in India in the early 1990s. 9. Sources that I linked earlier say the Alzheimer’s claims are dubious. The superfood website itself uses words like “speculated” and “potential” in talking about studies. They talk about ketone bodies again, and the study they cite on medium chain triglycerides (which apparently did not involve coconut oil or lauric acid) studied the usefulness of ketone bodies in adults with Alzheimers whose brains couldn’t use glucose effectively. There probably aren’t any implications for people whose brains CAN use glucose effectively. 10. Weight loss claims should always be treated with deep suspicion lol. The study on women with abdominal obesity compared the results between two groups taking either 30ml of supplemental soybean oil or 30ml of supplemental coconut oil; it was NOT a comparison between women who used coconut oil and women who did not add extra oil to their diet. The other study involved Malaysian men and women. It was a pilot study and there’s no mention whatsoever of a control group. WTF?!?! This isn’t science, and it shouldn’t be used as the basis for any claims. The lack of a control group is apparently good enough for a pilot study, which is merely intended to see whether the subject is promising enough to merit a full study, and isn’t meant to prove anything. Not having a control group wouldn’t pass muster in a “real” study. It’s well known that the knowledge that they’re in a study can change people’s behavior, and it’s likely that the pilot study subjects started watching their weight a little better because they knew it was being monitored. Coconut oil is 90% saturated fat. Saturated fat has been associated with heart disease for decades, although it's starting to look like the issue is more complex than we originally thought, and coconut oil proponents claim that coconut oil is special and different anyway. My article includes a couple of maps showing the heart disease rate in the "coconut belt" compared to the rest of the world, and if there's anything miraculous going on it sure is hard to see it.